In an effort to try and catch up on the blog, I’ll take us back to Arkansas, where Tim and I spent a few days in early December. On our second day in Little Rock, we decided to spend the day with Bill – Bill Clinton, that is. I don’t make it a point to visit every presidential library on our travels, but I had heard such wonderful things about the Clinton Presidential Center that I really wanted to check it out. We crossed the Arkansas River on the Clinton Presidential Park Bridge, the former Rock Island Railroad Bridge which was constructed in 1899. The bridge was converted for pedestrian use in 2011 and is now a part of the Arkansas River Trail. The bridge provides a great view of the center. Although some people have compared the design of the center to a double-wide trailer, I actually liked the architecture. It is a commanding structure and an even more amazing facility. Tim and I decided to take a tour, and our volunteer guide did a wonderful job of interpreting many of the exhibits on display. After first viewing the reconstructed Oval Office, we stepped into a replica of the White House Cabinet Room, where Tim proceeded to sit in the chair reserved for the Secretary of the Interior. How appropriate! There were lots of highlights, but I particularly loved the many piers that are filled with blue archive boxes containing White House correspondence. Another exhibit offered an interesting peek into life in the White House. It would have been easy to spend the entire day at the center, but we knew there were a few more things in Little Rock that we wanted to see. Before we left the Clinton Presidential Center, however, we stopped for lunch at Forty Two, the on-site restaurant. Its reputation as a quality farm-to-table experience was well-deserved. We also visited the center’s temporary exhibit featuring Dale Chihuly’s glass works. The intricate designs and bold colors were a feast for the eyes. 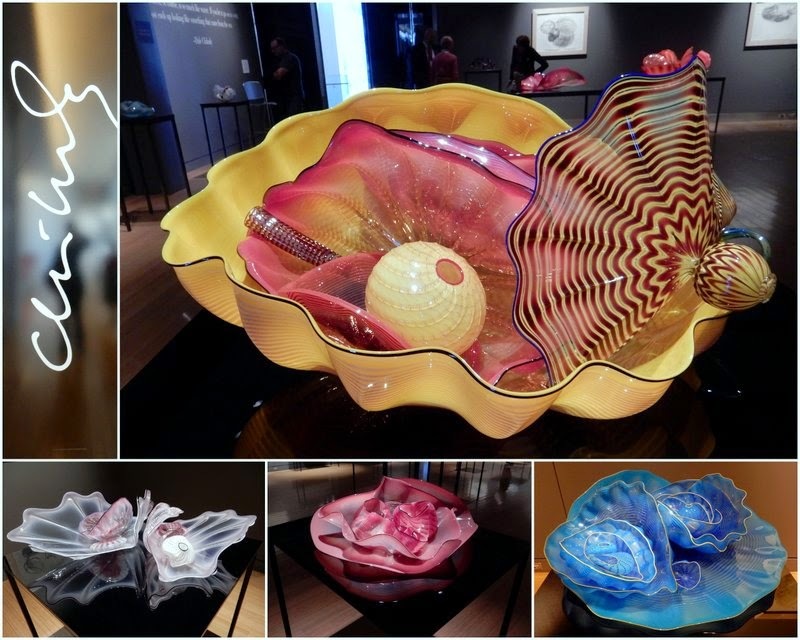 I’ve always enjoyed Chihuly’s work, and it was an unexpected treat to see such a large collection here. After finally tearing ourselves away from the center, we took the electric streetcar to the River Market district, where we wandered down to the riverfront park. We then re-boarded the trolley and took the complete tour of downtown Little Rock and North Little Rock. Our driver’s commentary tended to be more hyperbole than fact, but I did love his reference to the National Register of Interesting Places. Say what? Did he mean the National Register of Historic Places? "Where Shall We Go Next?" After completing the streetcar circuit, we walked back across the Arkansas River on the Junction Bridge, another former railroad/current pedestrian bridge, and arrived back at our campground on the river. It was a very good day.